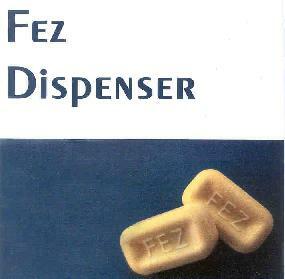 Fez Dispenser is a solo project from Los Angeles based musician Matthew Thorne. The music is characterized by a blend of 70's funk and fusion, space electronics, and more modern techno, hip-hop and Dub influences, to create something that is completely groove laden but ever so freaky. The recording and production is excellent and along with the head bopping and toe tapping abandon these seductive grooves will infect you with, there is also a definite cosmic edge and trip factor to the music.... grooves for the head if you will.... Shaft in space.... Superfly surfing the aether on a DJ's abused turntable. We've got downbeat jazzy techno hip hopping tunes with cool grooves and very nice keyboard and electronic embellishments. Mucho tasty guitar from time to time. And oodles of spacey jazz based strangeness. "Yet Again" is a highlight, bringing to mind Robert Fripp playing with Herbie Hancock. One of my favorite fusion albums from the 70's is John Tropea's "A Short Trip To Space", and much of this reminds me of that, but with a healthy extra dose of contemporary hip-hop and DJ gymnastics. File under cosmically soulful and very cool. For more information you can visit the Fez Dispenser IUMA web site at: http://artists2.iuma.com/IUMA/Bands/Fez_Dispenser. The CD is available from: http://www.cdbaby.com/FezDis.